Although they do not grow high in the Andes mountains, come from a grove of one square mile in Africa, ripen in a short three-day period after a dry winter and a full moon, or have a multi-level marketing company developing to sell them to us, onions should get our attention. They are an excellent source of a cancer-fighting, heart-healthy, brain-supporting flavonol called quercetin. Onions are inexpensive, they are available at your nearest grocery store, and they are easy to cook. In their 2003 book Phenolics in Food and Nutraceuticals, Naczk and Shahidi describe onions as the vegetable highest in flavonoids (though the field of antioxidant research grows by the year) and specifically a flavonol compound quercetin. Onions are rich in flavonoids and serve as one of the major sources of flavonols such as quercetin, isorhamnetin, myricetin and kaempferol conjugates in the diet. Of these, quercetin is the major flavonol in onions. Levels of quercetin glucosides are much higher in onions than those in other vegetables. We love onions. I hope you do too because we recommend that you eat a mountain of them. When you’re done with the mountain, throw some more onions in the pan, cook them up, and eat some more. One onion-buying (or onion-harvesting) factoid is that smaller is better. The flavonoids in the onion are more concentrated in a smaller onion, making them more rich in flavonoids, bite per bite (Lee et al. 2008). You might find small onions at a discount because no one else wants them. Buy them and run! Consider too that cooking may reduce the flavonoids. In a 2008 study of onion flavonoids, researchers found that the flavonoid content in the onion was reduced: frying by 33%; sauteing by 21%, boiling by 14-20%, steaming by 14%, microwaving by 4%, and baking showed no loss (Lee et al. 2008). To some degree, the flavonoids may end up in the cooking water or oil. For my part, I do not worry about the cooking loss in onions: I can eat about thirty times more onion cooked than raw and, as a result, cooking wins fairly readily. Eat onions. Eat them often. Eat them how you like them. 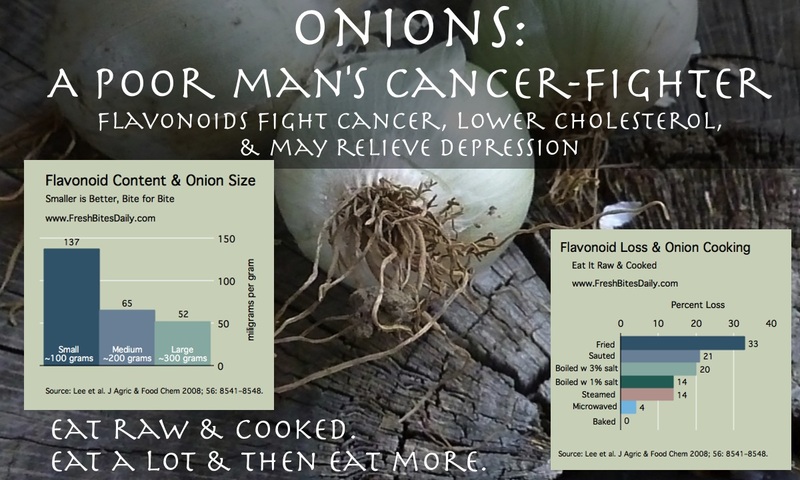 Feel free to use these infographics to educate others about the value of onions. Link back to this page as a courtesy.